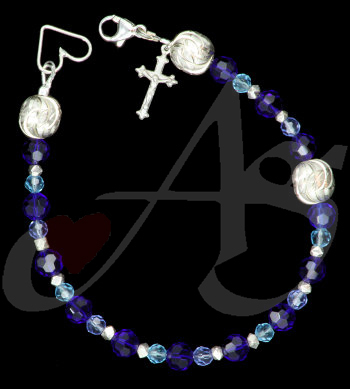 Various blues in this rosary bracelet reminding us of our Blessed Mother - Enjoy!! The sterling silver beads on this rosary bracelet are etched - they reflect the light and cast a twinkle. They are one of my favorite metal beads. The sterling silver metal bead within the crystal line also give a glint when moving on the wrist. I love the play of blue colors giving a description of Mary's Mantle. This Rosary Bracelet is made with round faceted blue Chinese crystals and round etched sterling silver .925. It features silver professional grade steel cable wire. This piece has lobster clasp w/ heart jump fastenings and findings. This item is decorated with a crucifix. Enjoy!